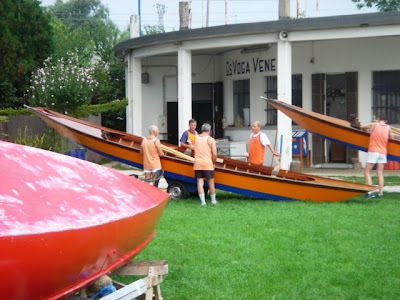 On a September morning, a few years back, I was invited to go for a row by some friends in the Gruppo Sportivo Voga Veneta in Mestre - a club I've been lucky to be a member of since 2000. 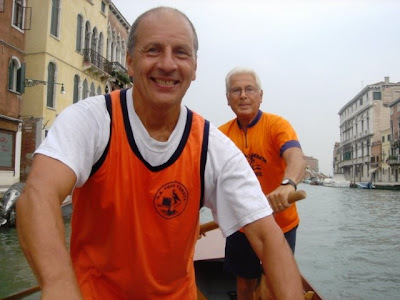 I was in Venice, and had been out on the water with my rowing coach, Arturo Moruccio. 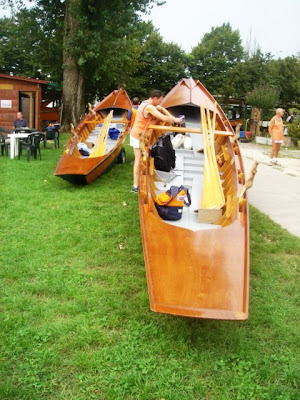 When we returned to the club, some guys asked us if we wanted to row through Murano on Saturday in a six-man caorlina. It sounded fun and relaxing. I'd just been through another of Arturo's "combat rowing" exercises, and Sunday was Regata Storica (14 men looking to out-row not only each other, but other boats in the process). Of course, I said "yes". Looking forward to a leisurely row, I showed up at the club Saturday morning, to find out that there were eight of us instead of six. instead of six guys out for an even-paced row on one boat, we would have two boats - each with four guys trying to be the boat in front. It was gonna be a race. After preparing the boats, we set out on the waters of the lagoon. At some point, a few of the guys decided that they would rather do some shopping at the fish market in Venice instead of rowing to Murano and back. I wasn't in a position to buy any fish, but I had fun watching them, and seeing how the whole thing played out for locals. As I expected, it was a bit of a race. Many of the guys on the boats were old enough to be my dad, but, like the Venetians on the expedition down the Hudson, they rowed fast, hard, and steady. It was a challenge just to keep up. I knew I was being "sized-up" for the Regata Storica, which would be the next day. I gave it my all, and, as usual, stepped off the boat with an education and some great experiences. 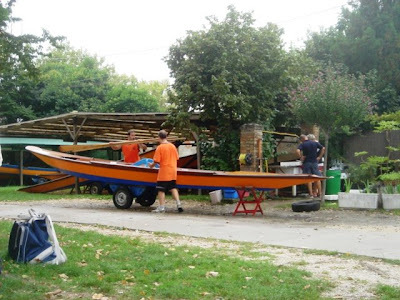 Cleaning up the boats and putting them away, I was thankful for what had happened - knowing that it had prepared me to row and keep up on the 14-man quattordesona the next day.